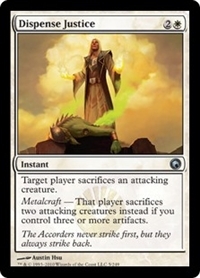 Target player sacrifices an attacking creature. Metalcraft — That player sacrifices two attacking creatures instead if you control three or more artifacts. 1/1/2011 The targeted player chooses which attacking creature(s) to sacrifice as Dispense Justice resolves.